Welcome to another monthly installment of the Secret Recipe Club, where the members select and make any recipe they like from an assigned blog, then blog about it. My assigned blog this month is Tami's Kitchen Table Talk. Although Tami posts main course recipes, she also has seriously decadent desserts, and I was quite happy to check out a few ... ya know, for scientific research. So I made a couple of Tami's desserts. Then just couldn't choose which one I liked better. I loved both. So the tie-breaker had to be the photos. That turned out to be much easier. 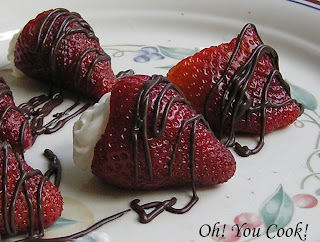 The Cheesecake-filled chocolate covered strawberries came out in focus almost as yummy as they tasted.